Patronology™ was created specifically to serve the gaming industry. It begins with market intel which translates to the casino's database to create meaningful programs that are executable and more importantly... measurable. Patronology results in a better way to value your most profitable customers, delivering a smarter reinvestment strategy with higher profitability. Relatively few marketing professional have command of the profit and loss of their marketing efforts, and fewer still understand profitability by patron. Property Type: Mid-Size property with less than 1,400 machines located in a very competitive market. Newer larger competitor cut the property off from the primary feeder market. Plus, an additional ten casinos within 50 miles. Challenge: Current segmentation consisted of only 9 segments based on a wide range of Min/Max ADT. 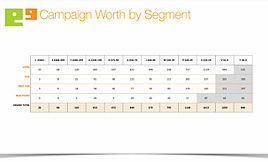 It consisted of worth segments grouped together as large as $5-50. In addition to this strategy they were also bumping patrons to higher levels based on their high frequency patterns. Strategy & Execution: Because there was a large quantity of players in in two segments ($50-99 and $5-49), Patronology recommended expanding the number of segments to allow more flexibility to monitor the progress of players as they shift in/out of segment levels. Measurable Results: Patronology’s strategy resulted in a total reinvestment savings of approximately $267,526. As a result in this strategy there was an -18% drop in patron count. However, there was a 16% increase in Slot Theo and 29% increase in Slot ADT year over year. NOTE: These were high frequency patrons (more apt to respond). Therefore this modification was necessary to ensure they’re still being touched but NOT over-invested. How does a small bi-level casino in a Masonic Temple in Kansas City, Kansas (with no parking lot) compete with a world-class Las Vegas-style casino at the Kansas City Speedway just 15 minutes away? Magnum was hired to manage 7th Street's player database by utilizing our Patronolgy Database Services.